USB phone is a kind of soft phone which can be connected to computer by USB interface. It can help us to have a phone call to/ from all over the world by computer voice software. Actually, the invention of USB phone is really a great innovation in the market of telecommunications. It is the USB phone that calls from PC to PC can be achieved. So does the calls from PC to telephones or mobile phones by VoIP. Therefore, the conditions like poor network signals are out of consideration. Compared with a normal headphone, USB phone is of a higher quality. Inverted turn in voice can be eliminate by the technology of voice compression. Compared to a normal phone, internet telephony is in the service of Internet instead of traditional telephone lines. As long as a USB phone and a PC computer with Internet, it is possible to have calls from any places of the world. At present, skype is the most popular software to achieve the technology. You can download skypemate to improve the effect of calls which is available in our website. Besides, USB phone also takes effect in skype, GotoMeeting, Webex and some video game software. Furthermore, the operation of USB phone is as easy as that of a flash disk. As long as you plug the phone to the USB interface of the computer, any other operations will be finished automatically. So is the unloading. As to the software, you can choose according to your requirements. For someone who is always on a business trip or work abroad, USB phone is necessary. 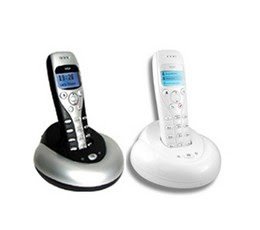 In my opinion, 160 feet usb cordless phone for skype is a good choice. The 160-foot radio range enables you to talk away from computer in the range of about 50 meters. Then businessmen will relief from staying around the computer in case of any missed calls.